The Museum Pass Program allows our patrons free access to some of the area’s finest cultural and educational attractions. This program is sponsored by the library. Museum passes are free to adults with a current Delaware County library card. Passes will be loaned out for 3-days, no renewals allowed. Passes must be returned by closing time on the due date or placed in the A/V return drop before the library opens the next day. Only ONE museum pass may be checked out per household at any time. Holds are not permitted on Museum Passes. You may call ahead on the day you wish to pick-up the pass and it will be checked out on your card and held for two (2) hours or until closing, whichever occurs first. If you do not pick up the pass within that time it will be removed from your card and made available to another user. Daily Overdue Fine: $1.00 per day up to the cost of the museum membership (varies from $75 & up). Lost /stolen membership card fee: $10 up to the cost of the membership (up to $500) depending upon the policy of the museum, zoo or cultural site. You will be charged a $5.00 processing fee if the envelope the pass circulates in is not returned. Museum Passes MUST be returned to the Middletown Free Library ONLY. You may return the pass, in the blue envelope, in the media return drop. Some museums offer additional benefits to library members including discounts at the gift shop, museum overnights, family memberships, etc. Please see the information sheet inside the museum membership packet when you check out the museum pass for more information. Museums may offer additional discounts and benefits other than what is listed here. More details avaialable at the library. Click on the name of the museum for hours, directions, special event and exhibit information. Admission for two (2) adults and up to five (5) children in the same household per visit. and for the overnight program. Includes free or discounted admission to some special events. Tours are available on Saturdays & Sundays in January as well on Martin Luther King Jr. Day. Admission for up to six (6) per daytime visit. Admission includes "The Voices of Eastern State" audio tour, hands-on history interactive experiences, history exhibits and artist installations. Not recommended for children under the age of seven. Admission for two (2) adults and up to six (6) children per visit. Two (2) passes available, you may only check out one pass at a time. Admission for up to four adults or students, plus half-price admission for a maximum of two additional guests. Children under 12 years of age are always free. Admission for two (2) adults and up to four (4) children. You will be asked to provide your name, email address and zip code when using the pass. Admission for up to six people including access to the Intrepid Museum, submarine Growler and Space Shuttle Pavillion as well as access to the Express Members-only line. Admission for tow (2) adults and up to four (4) children. Special member pricing for some special events. Admission for 2 adults and 4 children/students at a time to visit the Museum at no charge. Free admission for up to 4 people, they can be adults or children. Free admission for two (2) adults and all children under 21 living in the same household. 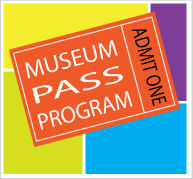 Also includes reciprocal admission privileges to over 800 North American museums and select Jewish museums nationwide. Free Admission for up to four (4) individuals during regular museum hours.